Mission Therapeutics is an early-stage drug development company targeting the ubiquitin pathway for the treatment of neurodegenerative disease, fibrosis, inflammation, cancer and other diseases of unmet need. 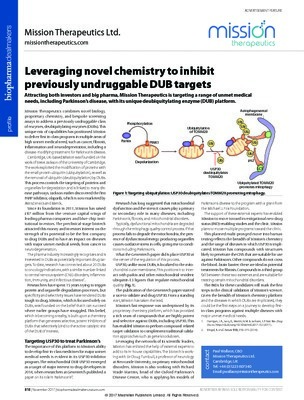 The Company has built a leading platform for the discovery and development of first-in-class, small-molecule drugs that selectively target deubiquitylating enzymes (DUBs) – an emerging drug class that is attracting significant commercial interest in the area of protein homeostasis. The Company has raised $125M from investors Imperial Innovations, Pfizer Venture Investments, Roche Venture Fund, Sofinnova Partners, SR One and Woodford Patient Capital Trust. Mission is based at the Babraham Research Campus, Cambridge, UK.